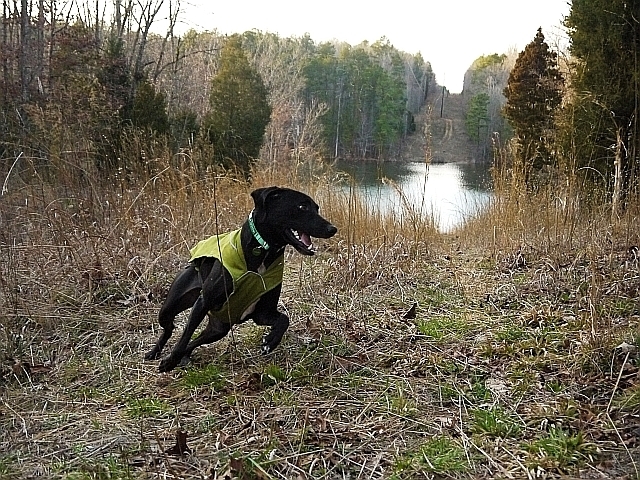 I don't normally make a habit of promoting companies on my blog, but Ruffwear has been a lifesaver for Fry's active lifestyle as a typical adolescent pointer/lab/whippet mix - if there is such a thing as "typical" for such a combination, that is! I felt it was worthwhile to mention some of the fine products we've found for Fry since so many of our friends are always asking about his "wardrobe" and the purpose and functionality of it all. 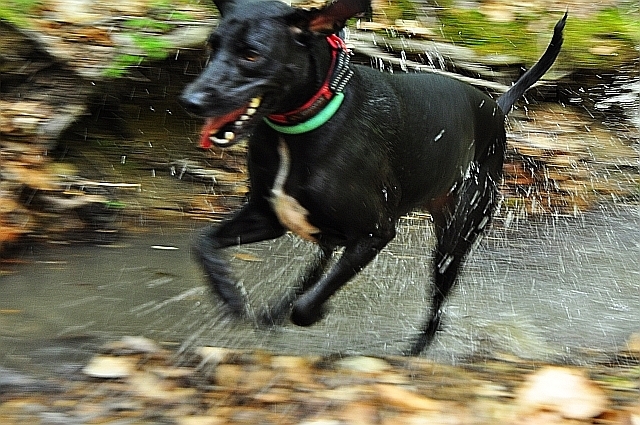 Steve and I are very active all year long and Fry is our constant companion on mountain bike rides, trail runs, swims, hikes, and wherever else life takes us. 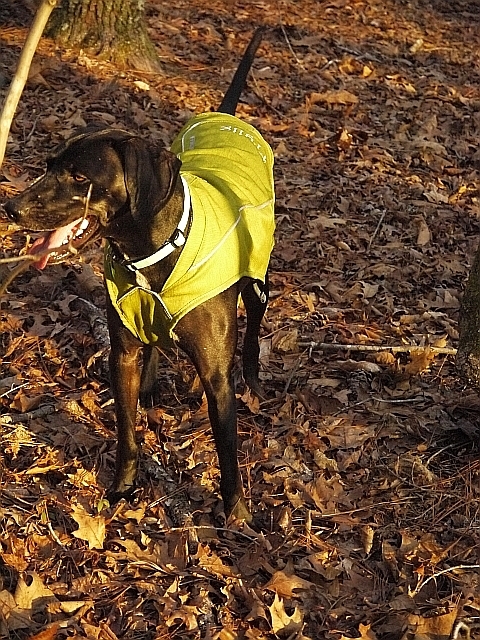 With his thin fine hair coat, during the winter Fry needs protection not only from the cold, but also from brushy undergrowth and briars, and his K9 Overcoats have been the ideal solution. 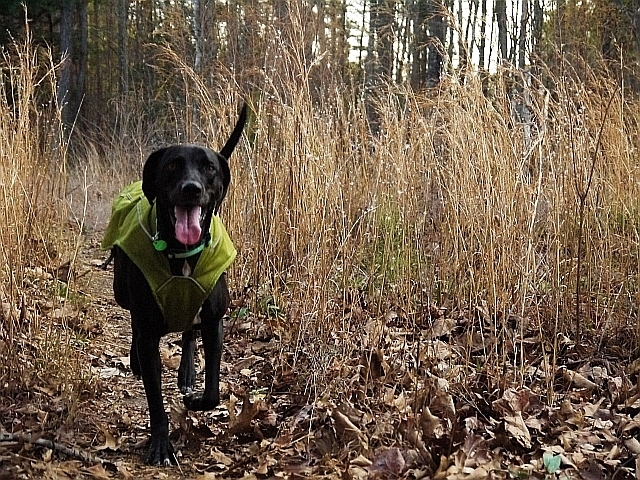 Constructed of a tough and durable, abrasion-resistant material, this jacket has worked so well that we got Fry one in each color. We love the way the chest panel fastens with elastic straps and allows full freedom of movement with absolutely no pinching of Fry's delicate underarm areas. 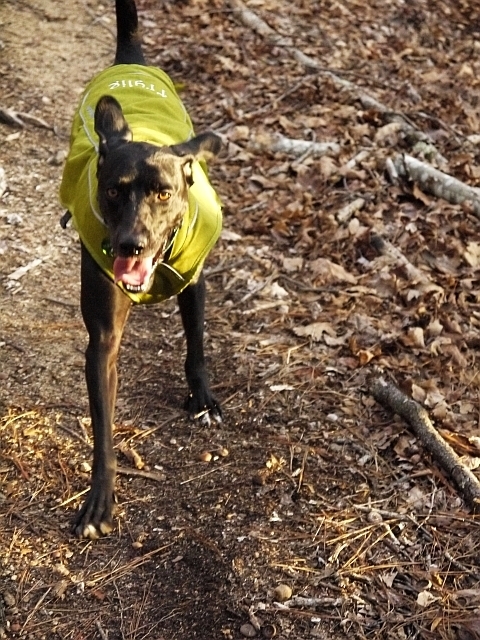 The panel keeps his tummy protected from brush, and the light fleece lining provides just enough warmth without overheating, even during intense trail running in cooler weather. 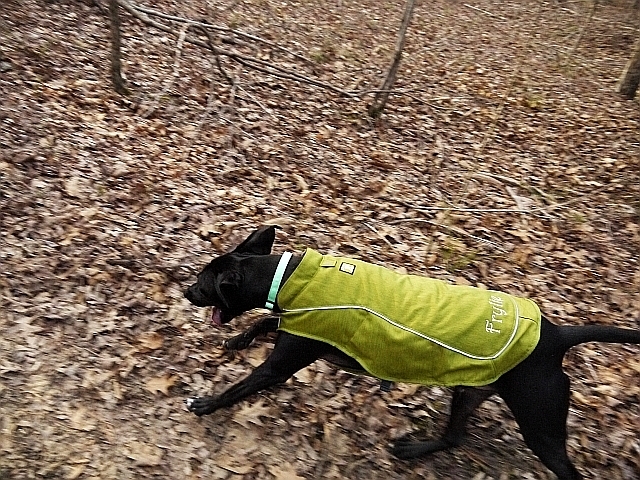 Another great addition to Fry's wardrobe has been his Web Master Harness. 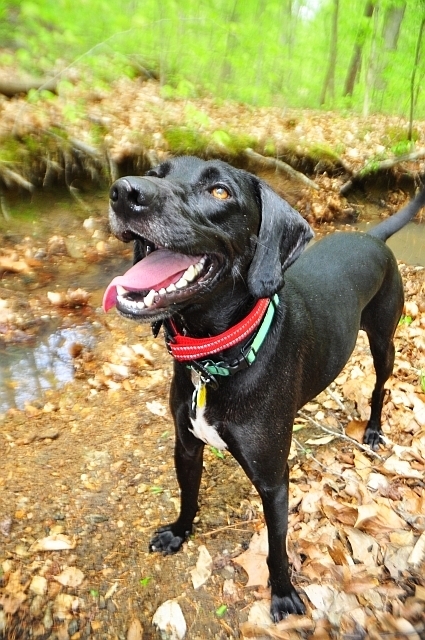 This works great for leash walks as well as romps through the woods. 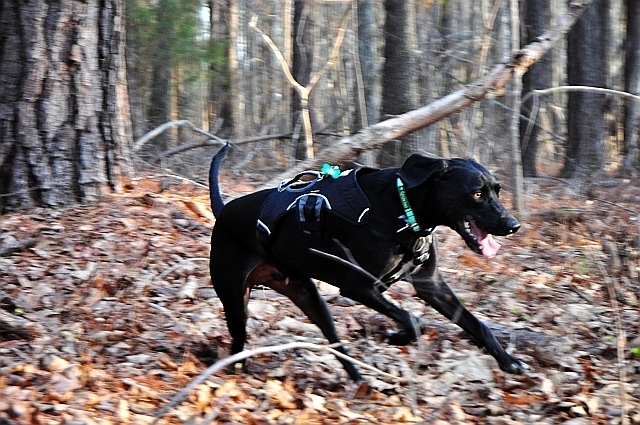 It has a solid feel and unlike almost every other harness we've tried, our slippery little boy isn't able to wiggle out of this one. LOL. 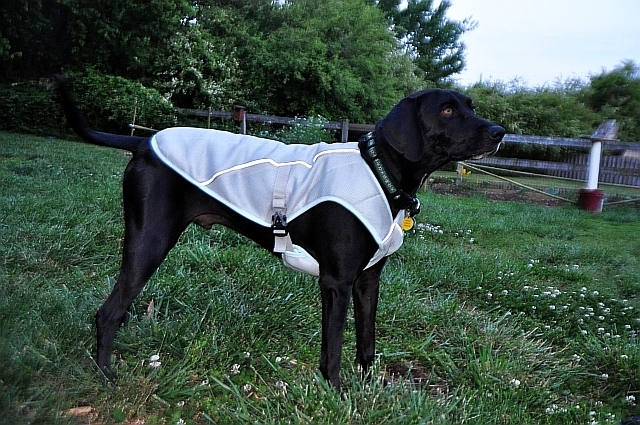 It has two leash attachment areas, one near the back and one up closer to the neck, and also has a nice handle in the middle for assisting the dog over rough obstacles. 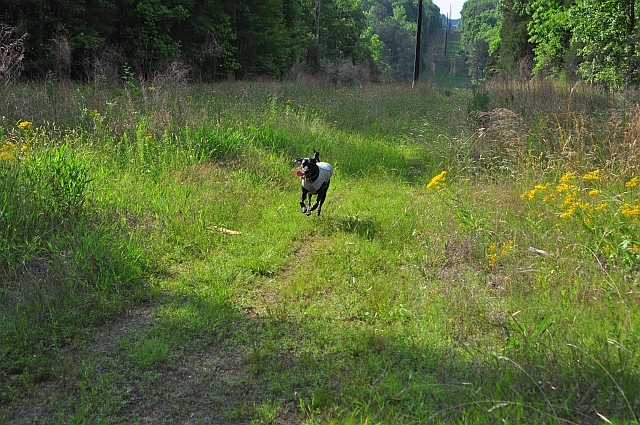 We haven't had to use it for lift assist yet, though, since we haven't been on any hikes that tough so far and Fry is amazingly athletic to boot. 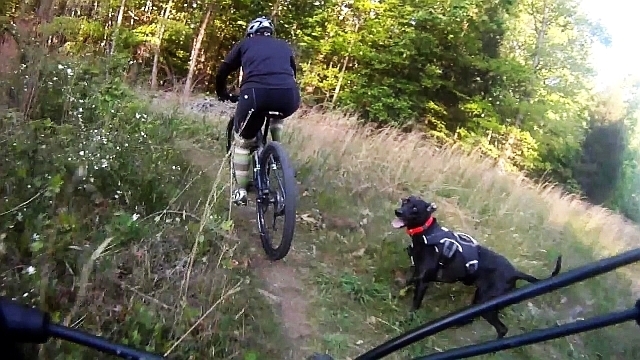 and his work as my cycling coach. 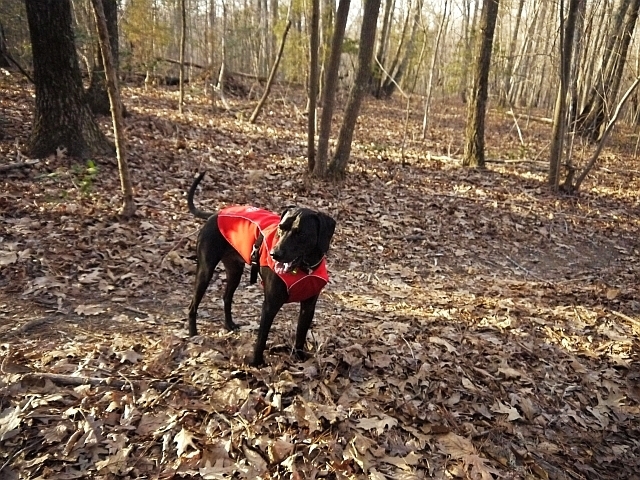 When Fry decides to roll in "doggy aromatherapy" on the trail and thus needs a bath on arrival back home, his snuggly fleece Climate Changer makes a terrific bathrobe for keeping him warm and clean while he dries, and he seems to really like the soft feel of it. 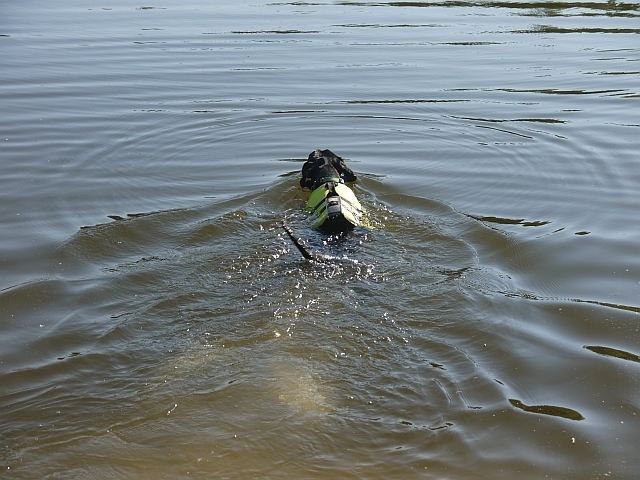 As the weather heats up, Fry also has a Swamp Cooler to help keep him cool on those hot summer days - although we do our exercise late in the evenings during those months when the weather gets oppressive. 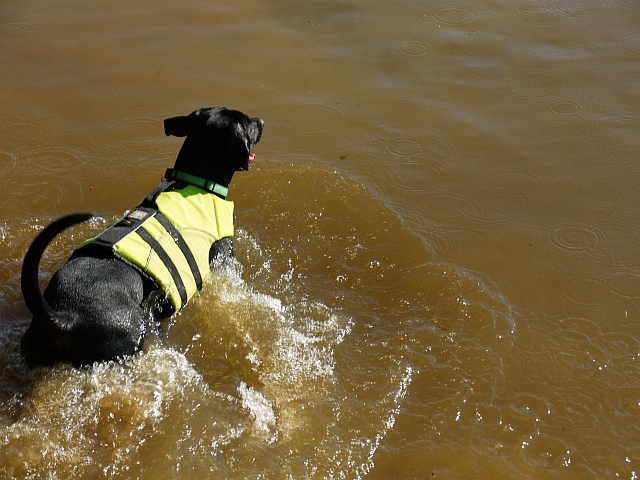 In addition, Fry has a K9 Float Coat life jacket for swimming and playing in the lake. 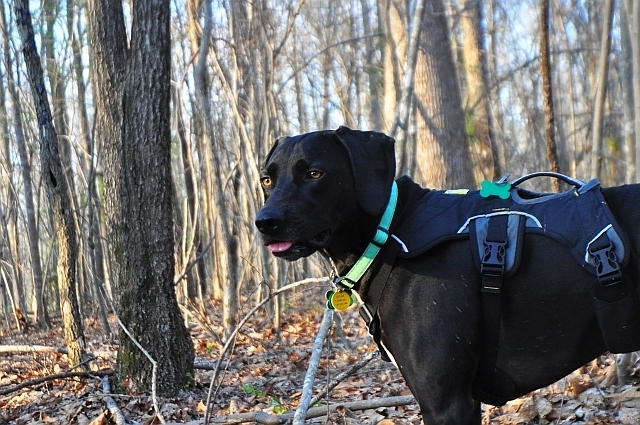 A wonderfully handy little accessory has been Fry's Quick Draw Leash. 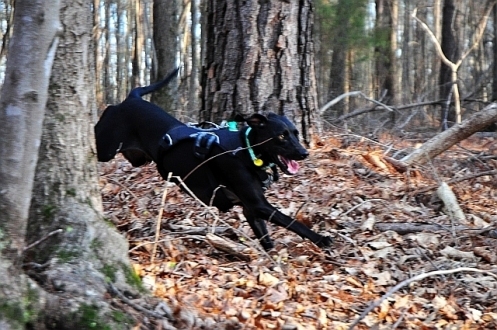 This is great for those trails where we're likely to encounter hikers or other bikers whose dogs may not be particularly impressed with Fry's sometimes exuberant friendliness, and lets us quickly and easily have him on a leash, yet is completely out of the way and securely fastened otherwise. 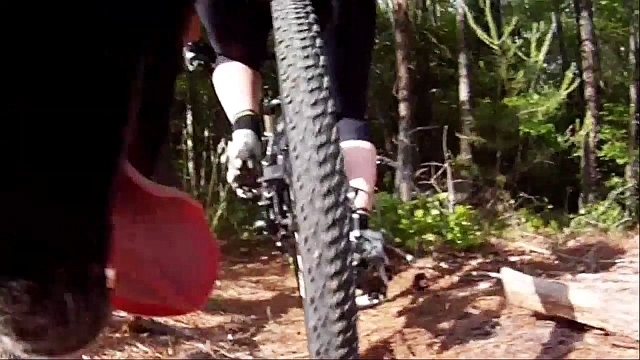 Like all Fry's other Ruff Wear, the Quick Draw is one tough customer. 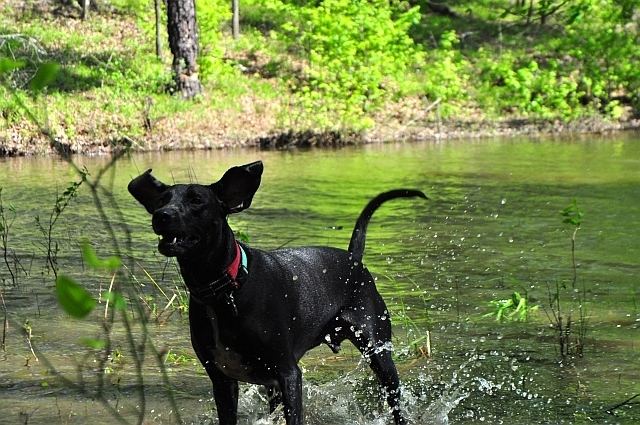 It stays on securely no matter how hard he runs or how ambitiously he plays in the water, and dries quickly without any signs of stinkiness. 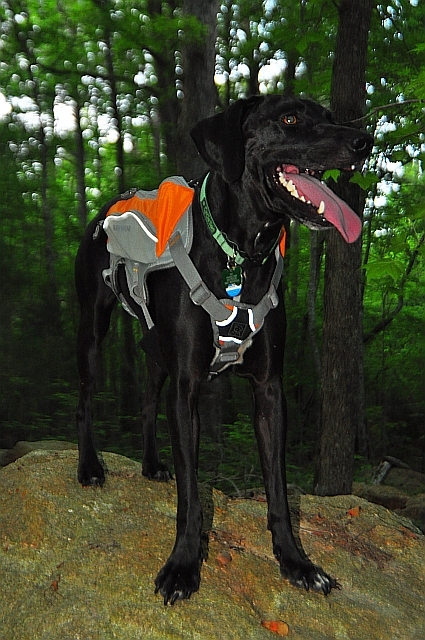 Finally, what mountain bike trail running pup wouldn't want his very own hydration pack? Enter the Singletrak, a cool mesh harness pack with two Platypus hydration bladders and convenient small accessory pockets for necessities. 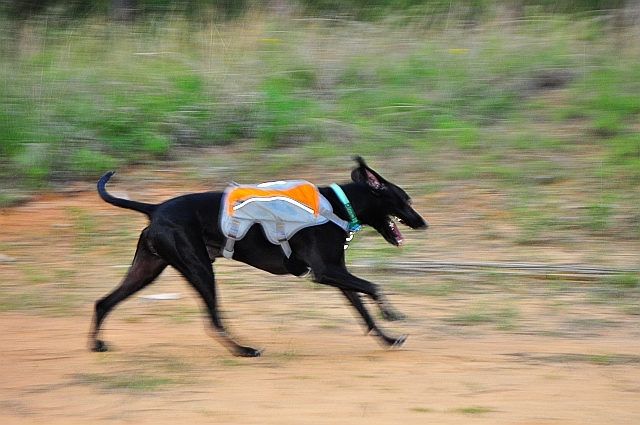 The Singletrak is tough enough to handle any trail, but light and cool enough (especially with ice water in the hydration bladders) for hard running doggies. 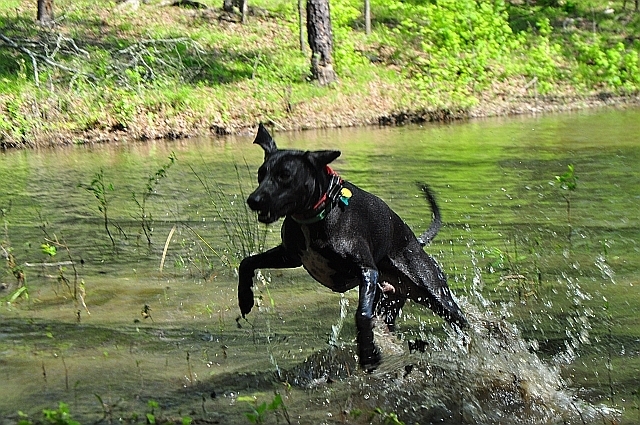 We love our active lifestyle and having a dog like Fry who enjoys the outdoors as much as we do is the best part of it all. 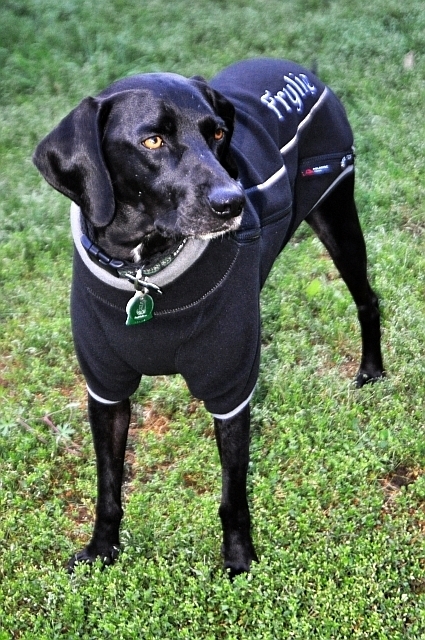 Fry is one tough pup, and we're thrilled to have found apparel and gear for him that allows him to "Ruff" it in style.